In the summer of 1977, a small group of like-minded University of Arkansas graduates, banded together to form the Fellowship Bible Church in Little Rock, AR. During the twenty-seven years that followed, the FBC congregation grew to more than 5500 members. In 1996, to meet the needs of this rapidly blossoming church, FBC built an expansive new Worship Center. In an ongoing search for methods to involve worshiper’s children in Bible instruction while the parents attend services, the ministry leaders sought creative ways to connect the children to God’s Word. They did this by using familiar and fun themes found in contemporary culture; themes with real and positive ties to the past that would capture the imagination and attention of the kids and motivate them to learn more about God. The solution was the introduction of a cluster of innovative “themed” classrooms: a clipper ship-inspired “Voyage of The HMS Gospel,”for 2nd graders; a futuristic space adventure, “Mission To Planet Earth Aboard The Starship Redeemer” for 3rd graders; the “Indiana Jones”-style “In Search of the Sacred Door” for 4th graders; “Knights of The Cross” held in a “medieval castle” for 5th graders and, “Yukon Ho,” a wilderness adventure environment for 6th grade students. The 75-minute classes are conducted twice in conjunction with each of the two services held on Sundays. Taking advantage of new technology to enhance Bible instruction, these classrooms have been equipped with a combination of CD, DVD, VHS, Power Point, video projectors, wireless mics, live actors and sophisticated puppetry, designed to engage as well as to educate. Traditional teachers instruct small groups of 8 to 10 children, with upwards of 70 youngsters in age appropriate lessons. With the exception of the 2nd grade, Voyage of the HMS Gospel, all of the classes rely on Sony SRP X700P powered A/V matrix mixers to integrate the entire range of input sources required to maximize the effect of these lessons. Due to the congregation’s size, services are held simultaneously in three separate buildings. 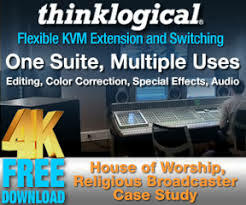 This requires the transmission of audio and video feeds from the 2000-seat Worship Centers main sanctuary to the Special Events Center which hosts ‘New Community’ services. 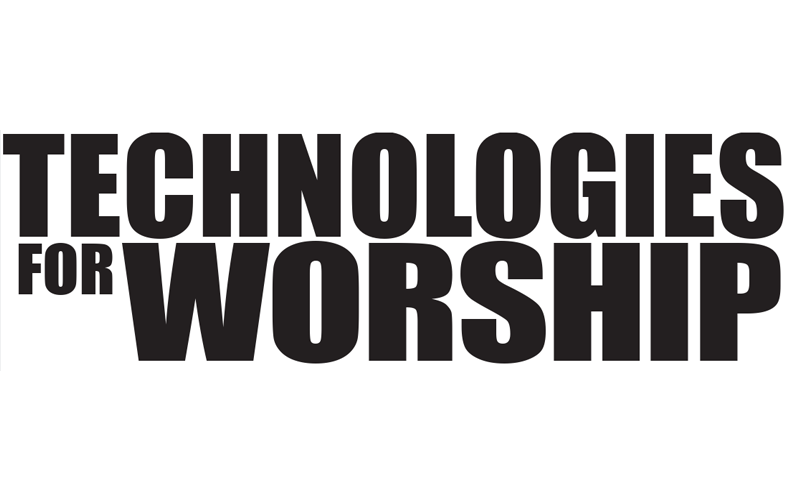 The transmission also extends to The Edge Worship venue in the Fellowship Student Center designed for ‘youth-oriented’ services. Mills and FBC Video Director Jud Archer worked closely with American Audio, Inc. (Ruston, LA) and Wagner Media (Houston, TX) respectively on the selection and installation of technology throughout all six buildings situated on FBC’s sprawling east and west campuses. “We ran tens of thousands of feet of multimode fiber throughout the grounds to ensure the highest level of interconnectivity,” Mills says. 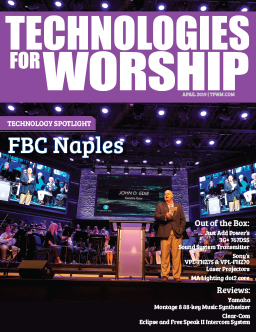 “This guarantees consistent quality for the pastors primary message in every one of our buildings, and assures us of uniformly sophisticated projection and audio distribution for services and events being held in the individual locations. “We were particularly concerned with establishing a delivery system capable of breaking away from the dry, standardized ‘closed circuit video’ look,’ Mills points out. “Our goal was to establish a ‘virtual pastor’ presentation which would give the audience a sense of genuine participation. An obvious method of accomplishing this goal is by making sure that the pastor speaks directly to the worshipers in the 450-seat Special Events Center and the 400-seat Edge venue. A more technical aspect of the solution relied on the placement of the projection screens (center stage), and the position of our Mackie 1530 powered speakers (stage left and right of the screen) to heighten the perception that the audio is emanating directly from the screen. All the buildings on the FBC campus have been designed to serve multiple purposes. The Edge venue hosts live performances by contemporary praise bands as well as energetic worship services. During the week it doubles as a gymnasium complete with basketball hoops and rock climbing walls. For Sunday services, however, it is transformed to a worship venue with the addition of curtains, stage extensions and subdued lighting.